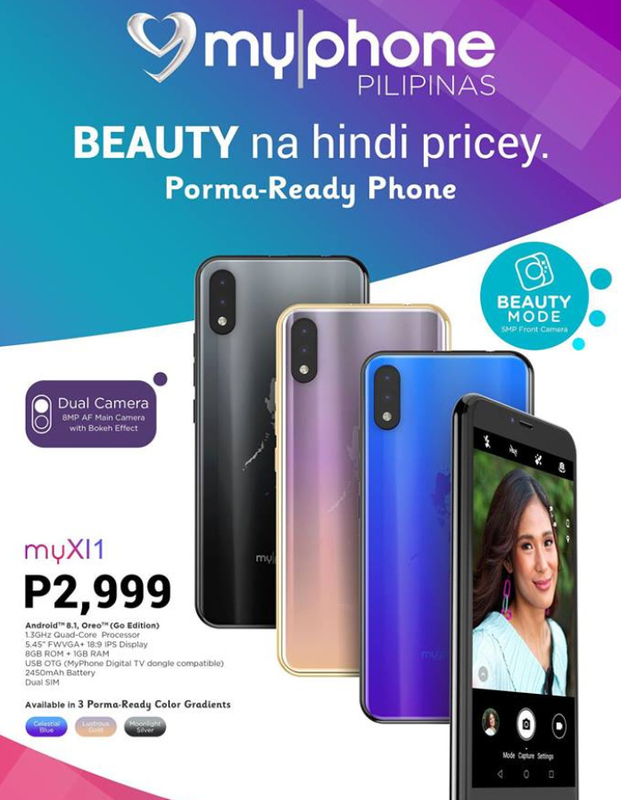 Proudly Filipino handset maker MyPhone has just announced a new Android smartphone that's targeted towards budget-conscious consumers who are looking for an affordable handset that looks great and has decent imaging capabilities for its price. One of the most striking features of the all-new MyPhone MyXI1 would have to be its gradient finish, a design trend which was started in 2018 by Chinese handset makers. 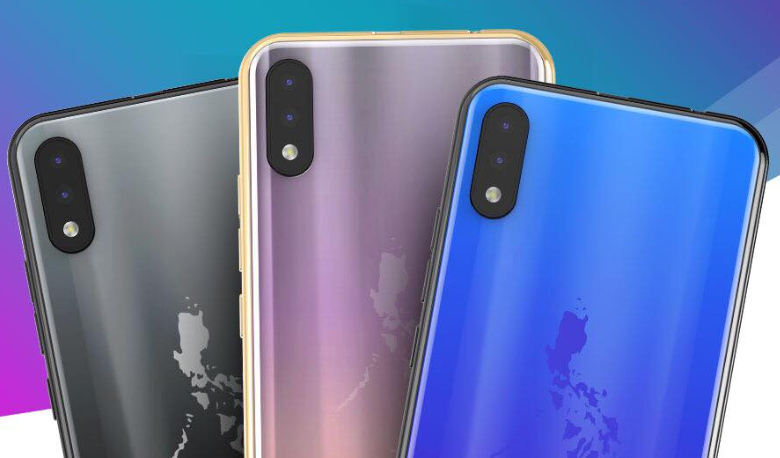 To be specific, MyPhone MyXI1 is available in three eye-catching hues with the above-mentioned finish: Moonlight Silver (Silver to Black Gradient), Lustrous Gold (Purple to Gold Gradient), and Celestial Blue (Light Blue to Violet Gradient). MyPhone calls these colors "Porma-Ready". All three have an eye-catching sheen, which is quite rare in devices in its price bracket. So I guess if you're on the look out for an entry-level Android smartphone that doesn't have a plain color and features a more hip design, you might want to check out this model. 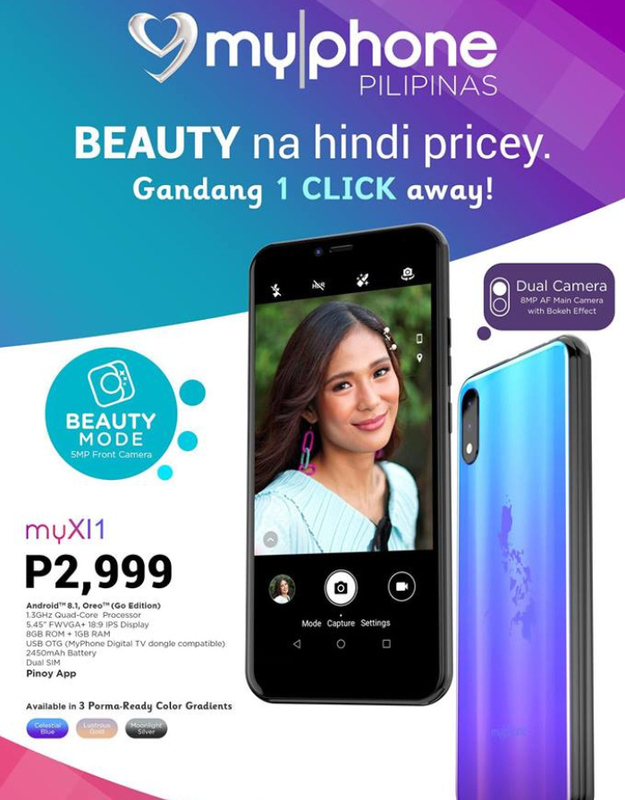 To quote Mr. Inyi Yruma - Marketing Head of MyPhone, "We incorporated gradient style to the design of MyXI1 because we wanted our kababayan, the Filipino masses who have supported MyPhone for almost 12 years, to feel good about having a premium-looking phone - of course - for a very affordable price. This is also our way of reinvigorating MyPhone's long-held advocacy of bringing great but affordable technology to the masses. As our tagline goes, 'Para sa Masa, Para sa Pilipinas. It's MyPhone.'" According to our friends from the company, another highlight of the MyXI1 is its 5 MegaPixel front-facing camera, which is already has a Beauty Mode. This software feature automatically evens out your skin tone in selfies, making them instantly ready for sharing on Facebook or Instagram. No need to edit or remove blemishes one by one using Photoshop. Aside from the front shooter, this smartphone also sports a Dual Rear Camera module made up of an 8 MegaPixel AutoFocus primary camera plus a Depth Sensor, which work together to deliver portraits or food shots with Bokeh or blurred background effect to highlight the subject. In front, the device is equipped with a 5.45-inch FWVGA+ 18:9 IPS display, which is large enough to provide a good viewing experience when watching videos on Youtube, browsing social media apps, reading blogs, and looking at photos. Under the hood, MyPhone MyXI1 runs its light-weight Android 8.1 Oreo Go operating system with a 1.3 GHz Quad Core processor that's complemented by 1GB of RAM and 8GB of expandable storage. This Dual SIM phone is powered by a 2,450 mAh Li-Ion battery pack, which can be charged using the microUSB 2.0 port that supports On-The-Go, making it compatible with the MyPhone DTV Dongle. Although this model is by no means a powerhouse in terms of technical specifications, it can be a great first smartphone for those who are still using a feature-phone or a basic handset with alpha-numeric keypad, allowing them to finally connect to the internet anywhere they are and to stay connected with friends and family using Facebook and Messenger. For those who are interested, MyPhone MyXI1 is now available at all MyPhone Concept Stores, kiosks, and authorized dealers nationwide for just PHP 2,999.